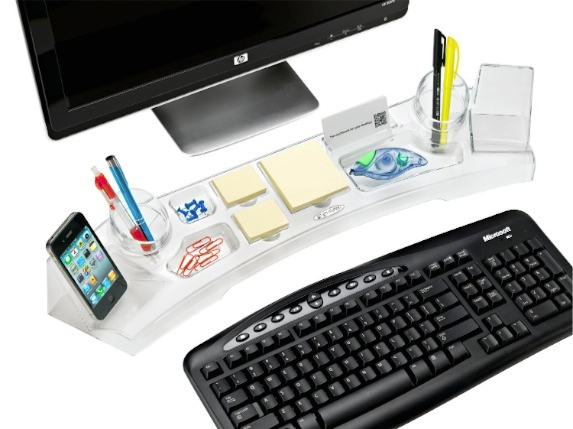 Make sure you organise specific places to store your work, stationery, and technology. This may take 15-30minutes of your time in the beginning but it will save you so much space and time afterwards. Leaving it on your desk will make it an uninspiring start to the day. Tucking your work in progress into a drawer will also help you leave the office with a less cluttered mind too. Often times we come back and just place them on our desk and think, “I’ll look at them later.” Items of little importance stay on our desk and just start piling up. Decide how you’ll handle it and plan accordingly. You’ll never find a messy Apple store as computers, tablets, phones are stood vertically! There is a reason why so many people are attracted to the streamline minimalist style of this brand. Don’t forget to tuck away smaller pieces of tech when not in use! Whether they are controlled with binder clips, 3M hooks or specialised cable organizers. Controlling the chaotic cables are a must to ensure a desk for work. It’s very important to plan out the flow of your desk at the very beginning, that way you can be inspired and productive all year round.